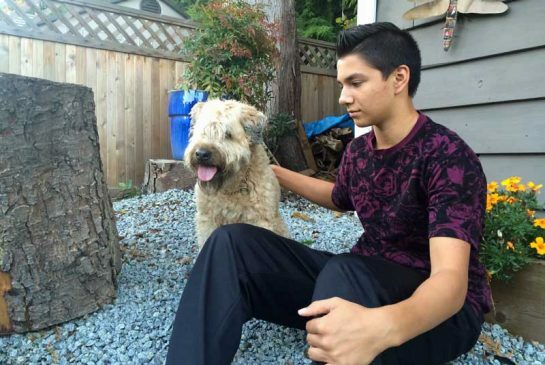 Fifteen-year-old Pierce Ormiston lives in Port Coquitlam, Canada, with his parents and dog named Dublin. The teen is used to seeing small bears in his backyard but he never thought one day he would face a large bear and fight it, in order to save his dog’s life. However, this is exactly what happened on September 23, 2015. Pierce was home alone with Dublin and around 8:30 p.m. that night, the young pet owner took his dog out. As usual, the lights were turned on and the boy clapped loudly in an attempt to scare off any small bears wandering around the home. Believing there was no wild animal out there, Pierce let the dog out, but a larger and hungry bear was waiting outside. Scared for his dog’s life, the boy grabbed a pot and a wooden spoon and banged loudly hoping to scare the bear away, but when this failed, the teen rushed back inside the house and grabbed the first thing he saw to defend his pet – a 6 in. kitchen knife. Pierce ran back outside and saw the bear had a hold of Dublin, without hesitation, the courageous boy charged the bear and stabbed it in its back. The knife puncture forced the bear to release the dog and both, dog and teen, ran back inside the house. The bear hung around the property with the knife lodge in its back for a while longer but then retreated into the woods. Miraculously, Pierce and Dublin didn’t have major injuries from the bear attack, just a few scratches. Area police set up a bear trap but took it down a few days after. No injured bear was found and authorities believe the bear could have survived the knife stabbing or hid and died. Pirece and his family are glad this attack did not turn into a tragedy. The teen and the dog were shaken but happy to be alive and unharmed. I would do the same thing for my pet too.I hope the bear is doing fine but he know not to go in that backyard.All pets are like family member we love them.